All the Windows XP and Vista users who skipped Windows 8 won't be able to upgrade to Windows 8.1 directly. "Windows 8.1 Preview upgrade installations from Windows Vista and Windows XP aren’t supported," Microsoft mentioned on its website. The only way to install Windows 8.1 is to first buy Windows 8 licence, upgrade from XP or Vista to Windows 8 and then upgrade to Windows 8.1 from the Windows Store. Which makes perfect sense because it's a service pack and not a standalone OS release? it's not really a service pack. It's like a feature pack and service pack rolled into one. Service packs are dead, even Windows 7 isn't going to get new service packs, instead, we'll be getting continuous updates. That's a bold statement to make even Microsoft came out with that statement back in 2004 when they said service packs nor updates will ever be needed with Windows Vista and guess what they still rollout updates and service packs. Service packs are here to stay since it's proven they are a necessity and Microsoft can rename it whichever way they like it's still a service pack because no one is going to sit around and update their freshly installed OS with updates from current to 6 or so months ago. okay, first, Microsoft never said such a thing in 2004. Windows Vista Service Pack 1 and 2 were planned and released as planned. But hey, if you don't believe me, good luck waiting for Windows 7 Service Pack 2 (spoiler: it isn't coming). Windows 8.1 is a new version of Windows, after last year's Windows 8. 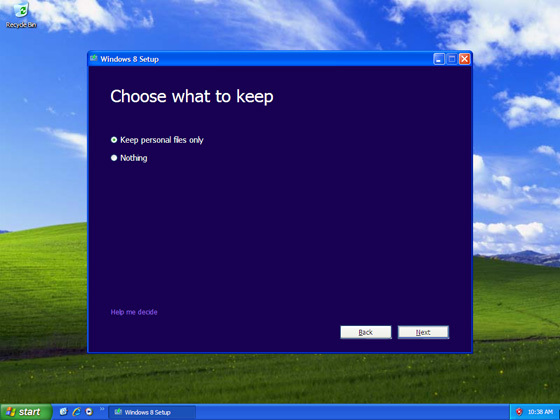 All new major/minor releases of Windows will now be on a yearly basis. This is the new normal. It is not a service pack. I didn't expect a service pack 2 for windows 7 to come out since it's being phased out and I don't think they'll roll out 2 or 3 service packs for each OS unless it's completely necessary to the point there are countless of compatibility issues but what I'm saying the way they are treating windows 8.1 is the same treatment given to Windows XP service pack 2 not only with rollup updates but new features as well since the planned release of Vista was delayed for that year (2004). Service Packs aren't going away when Microsoft plans to rebuild their OS from the ground up again like they did Vista carrying countless compatibility issues that's the new norm. I think they are taking it to a new creative level instead of calling it service packs it'll now be 9.0 to 9.1 etc. Microsoft will never let the Windows team re-build windows the same way they did for Windows Vista, it was a huge mistake for the company, and they paid dearly for it. It will never happen again. Microsoft has no plans to "rebuild their OS from the ground up again like they did Vista". That is exactly what caused all the compatibility issues, service packs rarely cause compatibility issues. Windows 7 isn't being phased out either. It is still actively supported and will get extended support for the foreseeable future. It just isn't going to get another service pack, only continuous updates. Windows XP service pack 2 was the exception, not the rule, Microsoft had to add new security features to Windows XP because it was getting attacked like crazy. They didn't have much of a choice. Windows 8.1 on the other hand, is by choice, and is getting updated in this fashion by design. It isn't the same thing, and it definitely isn't a service pack. Constant updates are the same in the long run as one big update. Windows 8.1 isn't a new OS. It's a service pack, even if that term isn't what they're called anymore, that is what is is in practice. That's silly to think they won't rebuild it again they already did it before with Windows Me and that was a failure and here they go again with Windows Vista. Times change and new attacks happen everyday that's something that will be inevitable so with that said Microsoft has to change their OS according to the times and threats to keep themselves competitive and secure so rebuilding the OS will be inevitable although they will use different methods in building the OS but nonetheless compatibility issues will arise no matter what and the rush to get the new OS into the market will also play a factor in it's shortcomings. History has a way of repeating itself in every shape and form that's just life. It is a service pack type thing, of course it will not.